Argentina's nuclear regulator has extended the operating licence of the Atucha 1 nuclear power reactor. 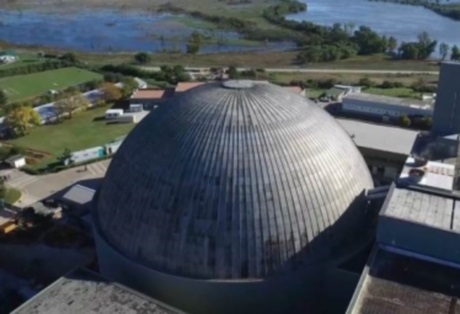 The licence extension allows the 44-year-old 362 MWe (gross) pressurised heavy water reactor - the first nuclear power plant in Latin America - to operate until 2024. On 9 April the Autoridad Regulatoria Nuclear (ARN) issued an amendment to the operating licence of Atucha 1, which authorises the start of Stage A of the plant's long-term operation. ARN said that during this phase progress will be made in the preparation of the plant's modernisation project, which would make its operation viable in the longer term, at Stage B. The new permit allows Atucha 1 to operate for five years of full power generation, or until 29 September 2024, the end date of the current periodic safety review, whichever occurs first. A formal delivery ceremony was held on 12 April at ARN's headquarters in Buenos Aires, during which ARN chairman Néstor Masriera presented the amended operating licence to Rubén Semmoloni, president of Nucleoeléctrica Argentina SA (NA-SA). Construction of the Siemens-supplied Atucha 1 plant began near Lima, 100km northwest of Buenos Aires, in June 1968. The plant - also now known as Peron - entered commercial operation in June 1974. Atucha is home to two of Argentina's three operating nuclear power plants, all pressurised heavy water reactors. With total generating capacity of 1627 MWe, the three units - Atucha 1 and 2 plus Embalse - provide about 10% of the country's electricity. A prototype domestically designed and developed 25 MWe small pressurised water reactor - CAREM - is under construction at a site adjacent to the Atucha plant.